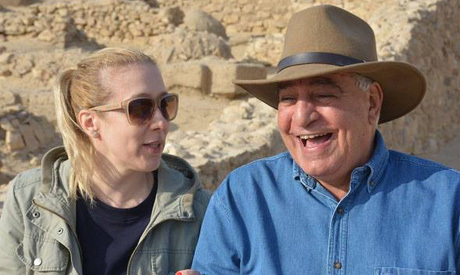 Deputy Chief of Mission of the Slovakia Ambassador to Egypt Ivana Majerova has visited the cemeteries of the builders of the pyramids in the Giza plateau accompanied by world-renowned archaeologist and discoverer of the cemeteries Zahi Hawass. He confirmed to her that his discovery proved that builders of the pyramids are the Ancient Egyptians whose names are engraved on the cemeteries. Majerova told Al-Ahram Weekly how overjoyed she was after visiting the Ancient Egyptian cemeteries and that she is infatuated by ancient Egyptian history. She added that she would definitely return to the Pyramids plateau with a group of 200 Slovakian tourists.